Magdalen Nabb published The Monster of Florence in 1996 in the U.K., the 10th of her 14 books featuring Marshall Guarnaccia of the Palazzo Pitti station of the Carabinieri. But for some reason I have never been able to understand, it has never been published in the U.S. until now, with the new edition from Soho Crime. The Monster is quite different, in one striking way, from the other Guarnaccia novels. 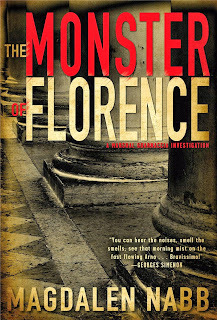 While all of them deal with large topics of human life through the watery lens of Guarnaccia's eyes (he's allergic to bright light), in terms of ordinary families and ordinary crimes, Monster is a documentary novel, with barely obscured material from the case files of the actual Monster of Florence case (also the subject of a Douglas Preston best selling true crime book and a Roberto Benigni movie). But overall, Guarnaccia remains as his usual melancholy and laconic self, anchoring the book in the canon of Nabb's celebrated crime fiction and in the recognizable reality of the citizens and the tourists of Florence. The case involves, on the one hand, a group of Sardinians and rural Tuscans suspected of the brutal murders of a series of couples parked in dark lanes, seeking some privacy at a time when that commodity could be difficult for young Italians to find. The case spans a number of years from the '60s well into the '80s, and while it was the subject of much investigation and many theories, no one was definitively convicted (though a number of suspects were detained and even brought to trial). In Nabb's telling of the tale, Guarnaccia is roped into a new investigation, some years after the last murder, in which a prosecutor seeks to shift the case away from the Sardinians previously suspected onto a subliterate child abuser, perhaps an unattractive patsy sacrificed to the prosecutor's ambition. The Marshall as usual is very humble regarding his own abilities, a situation that is for a while seemingly reinforced by the others involved in the investigation. But Guarnaccia and a few others begin to pull on a thread that may at least suggest who the real killer was, and what his motive might have been. Alongside the Monster case, the novel includes a subplot concerned with the possible forgery of a painting left to a young architect by a father who had abandoned him, and the relief from the sometimes confusing documentary evidence concerning the primary case is gratefully appreciated by the reader. In fact, when the conclusion (if it can be called that) arrives, it is clearer to Guarnaccia than the reader. Nabb requires the reader to do some work, rather than feeding a solution as if predigested. One has to read between the lines, even mull over (or look back over in the text) the facts of the case. The suspect (the one proposed by the prosecutor and the one proposed by the Marshall) remains unnamed; the one in the prosecutor's case is frustratingly present in the novel (an annoying subject of long interrogations) while the one proposed by Guarnaccia is frustratingly absent. The fogginess of the "answer" is singularly appropriate to this actual case, but once in the mind it's very persuasive (and it's the same solution proposed by Douglas Preston, in a very different narrative). The reader has to follow Nabb and Guarnaccia and reach the goal on his/her own. The solution of the secondary case is equally ambiguous but more expllcitly portrayed, and more typical of the series. The Monster is powerful in its indirection and its presentation in a fictional context of the facts of a real and celebrated case. While it may not be to everyone's taste, not even to every Nabb fan's taste, it's both a very effective crime novel and something more than a crime novel. We should be grateful to Soho Crime for making it more accessible to American readers.